Custom Self-Adhesive Labels - 6x6 - Digitally printed color-fast peel-and-stick labels (aka, stickers) rated for 5 years. Window Decals have peel-and-stick adhesive on the back side to allow for placing on flat surfaces, such as glass, counters, doors and walls. 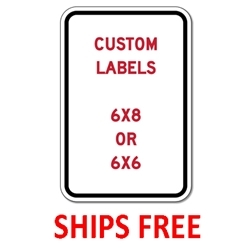 Design your custom label and place your order online right now! Be sure to include your email address and phone number during checkout.